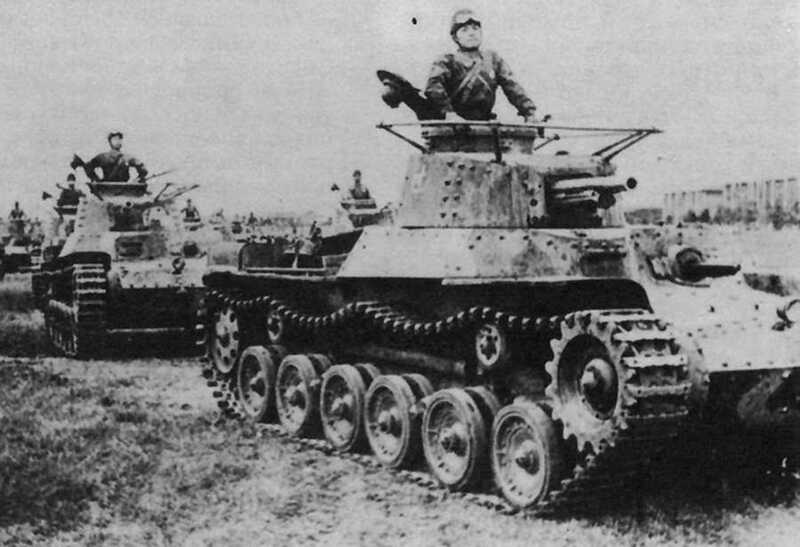 The Type 97 Chi-Ha, with nearly 2100 units built (including the improved (Kai) version), was the second most produced tank in Japanese history, after the smaller Ha-Go. It was found everywhere in Asia, soldiering from the cold steppes of northern Manchuria and Mongolia to the jungles of New Guinea, Burma, the Eastern Indies, and all around the Pacific. Early model Chi-Ha’s taking part in maneuvers. The Chi-Ha (“medium tank third”), or ordnance Type 97, referring to the imperial year 2597, was first preceded by a thorough examination of the main IJA medium tank by 1935, the Type 89 I-Go. It had proven to be too slow to operate effectively on the wide expenses of China, and did not suit well with the new tactical requirements of motorized warfare, as seen particularly during the invasion of Manchuria. 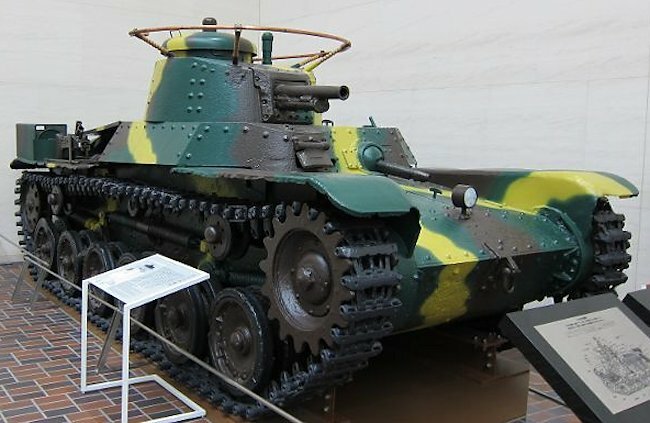 As a result, a new specification was issued to Japanese companies, among those Mitsubishi, which responded quickly with a design of its own, inspired by the fast light tank Ha-Go. The Tokyo Mitsubishi Heavy Industries complex delivered and tested the first prototype as early as April 1937, followed by a second one in June. As required by the ordnance, it had the same 57 mm (2.24 in) gun featured on the Type 89. Meanwhile, Osaka Arsenal also delivered its prototype. Although cheaper than the former, it was ultimately rejected because of the end of all peacetime budgetary limitations, following the second Sino-Japanese war of June 1937. The Chi-Ha was developed at the same time as the Type 97 Chi-Ni. The Chi-Ni was a cheaper, easier to produce alternative, with many components shared with the Ha-Go Light tank. At the time, the Chi-Ni was the Military’s preferred vehicle, mostly due to its cheapness. However, with the event of the Marco-Polo bridge incident, the beginning of hostilities with China, the Chi-Ha became the favored vehicle as peace-time budget constraints went out the proverbial window. The Mitsubishi design heavily relied on previous features present on the Ha-Go, as well as some innovations. These included a set of 12 buttons situated in the turret, linked to a corresponding set of buzzers which acted as instructions for the driver, as there was no intercom. The driver sat on the right and hull gunner to the left. The tank commander was also the gunner, seated inside the turret, and assisted by a loader/radioman/rear machine-gunner. Like previous models, the turret had no coaxial machine-gun, but a rear turret ballmount, housing a Type 97 machine-gun. The turret was equipped with a relatively large commander cupola. Later, a horse-shoe radio antenna was mounted. The suspension was a virtual repeat of the bell-crank system, but with an extra bogie. This gave a total of six road wheels on each side, two paired and two independent. This crude system was meant for easy maintenance, not comfort. The long, bolted hull was still relatively low and narrow, making this model less maneuverable, but faster, more stable and more difficult to hit. The main gun, the Type 97 57 mm (2.24 in), was an infantry support piece of artillery, with low velocity and poor antitank capabilities. However, these were sufficient against most Chinese tanks of the time. An interesting feature is that the gun had a limited traverse (10 degrees) inside the turret. Armor was slightly thicker than on the Ha-Go, ranging from 8 mm on the bottom (0.31 in), to 26 mm (1.02 in) for the turret sides, and up to 33 mm (1.3 in) on the gun mantlet. This was sufficient against 20 mm (0.79 in) and some 37 mm (1.46 in) weapons. However, the propulsion system was quite revolutionary, with a brand new V12, 21.7 liter diesel, air-cooled engine, developing 170 bhp at 2000 rpm. This proved sturdy enough to be produced until 1943. The Chi-Ha chassis-propulsion was successfully reused for other derivatives. By September 1939, around 300 units had been produced, and quickly tried in China. A more violent baptism of fire was received against Russian armor at Nomonhan Plateau (Battle of Khalkin Gol). Despite having good performances, these tanks proved themselves ill-matched against most Russian tanks, including lightly protected models like the BT-5 and BT-7. The Soviet models possessed high velocity 45 mm (1.77 in) main guns, which outranged the Japanese tanks. The Type 97 infantry gun proved useless during these engagements. The reports made after these events prompted an upgunning and upgrade effort inside the army. A new 47 mm (1.85 in) high velocity gun was developed and tried at the beginning of 1941. This new Type 1 gun required turret modifications, which resulted in the main variant of the type, the Type 97 Chi-Ha Kai. 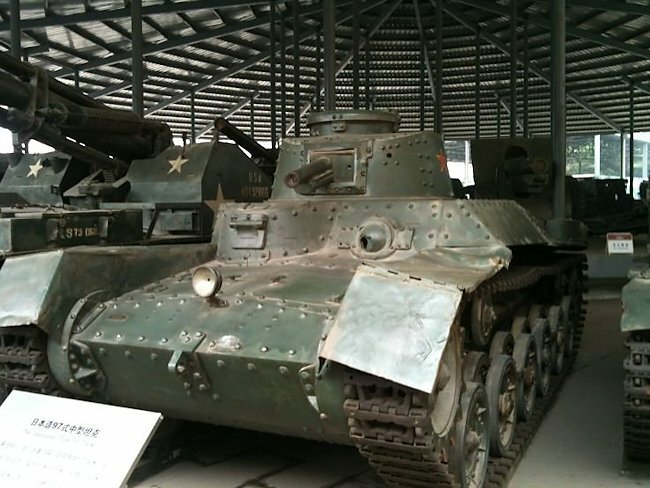 The Chi-Ha production ended early in 1942, with a total of 1162 being delivered. The production line was adapted for the new improved model. 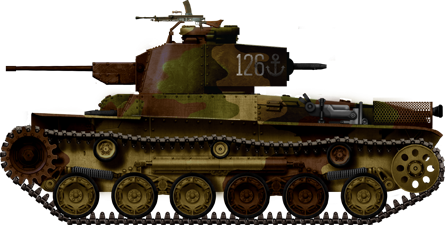 The Type 97 Chi-Ha Kai (Sometimes called “Shinhoto Chi-Ha”) was simply a rearmed model, using the new Type 1 47 mm (1.85 in) army gun. This long-barrel (2.5 m), high muzzle velocity (730 m/s) gun was developed when the Type 94 model proved insufficient to defeat the armor of most Russian tanks of the 1939-40 generation. The gun itself had been tested since 1938, and was at first rejected because of poor performance. But, after some improvements, it was adopted by the IJA general staff as the new main antitank gun. A tank variant was developed by Osaka Arsenal, most being given to the new Chi-Ha Kai. It had better performance, a muzzle velocity of 830 m/s (2,723 ft/s) and a maximum range of 6,900 m (7,546 yd). A total of 2300 of these guns were produced until 1945. 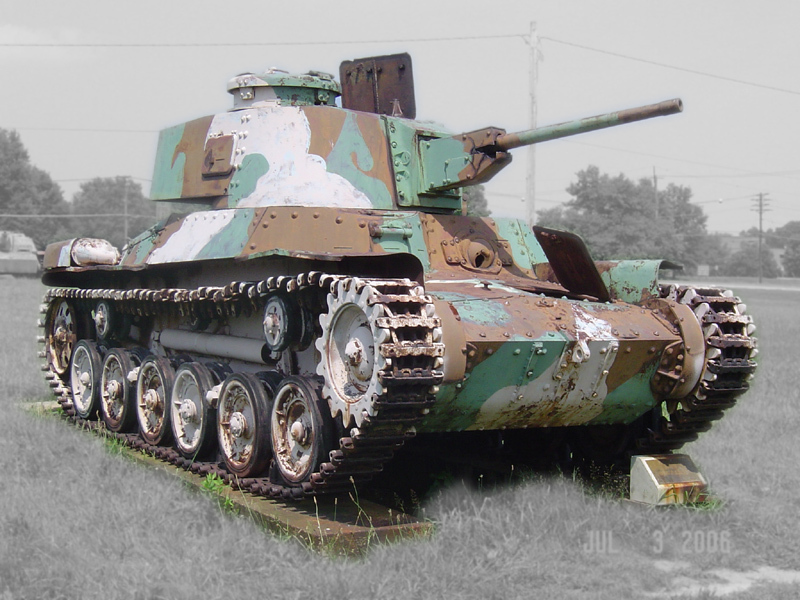 The first Chi-Ha Kai prototype was ready only at the end of 1941, and production began early in 1942. This new model completely replaced the Chi-Ha on the factory line. When production finally stopped in 1943, 930 had been delivered, despite an army request for more than 2500. This was mostly due to the lack of raw materials the Japanese industry suffered daily. 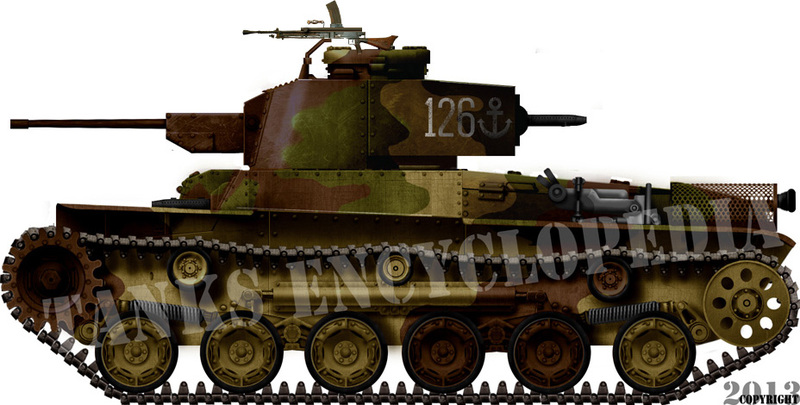 However, the Chi-Ha Kai design was largely incorporated into the new Type 1 Chi-He and derivatives. As the most largely produced and tested medium tank, the chassis was found suitable to create countless specialized variants during the war. Chi-Ha Short-Gun: An infantry support variant equipped with a 120 mm (4.72 in) short barreled gun, designed to support the Imperial Japanese Navy’s Special Naval Landing Forces (SNLF). Type 4 Ho-Ro: Just 12 of these Self-Propelled Guns were produced on the Chassis of the Chi-Ha. It was armed with a 150 mm (5.9 in) short-barrel Type 38 howitzer. Type 97 Shi-Ki: Command Tank variant. It has a smaller, unarmed turret topped with a large cupola and horseshoe-antenna. The 37 mm main armament was moved to the hull in place on the bow machine-gun. The Chi-Ha was, along with the Ha-Go, formed the bulk of IJA and Navy armored forces in eastern Asia. 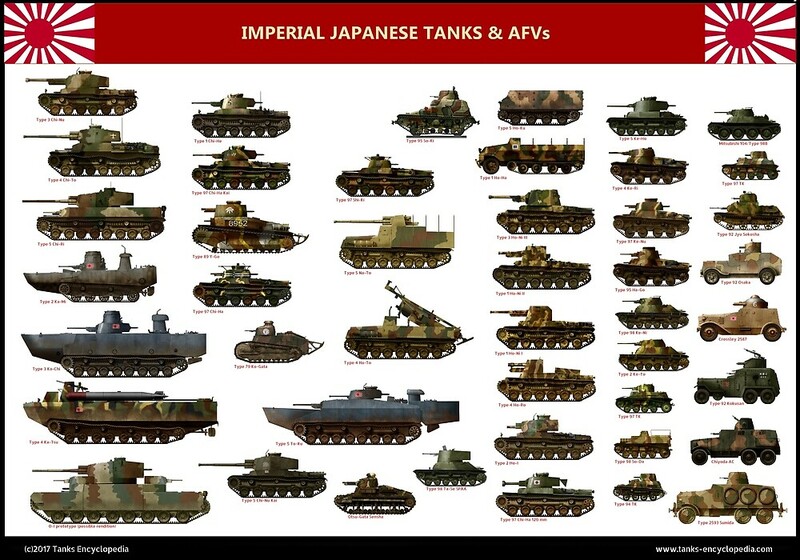 They were the most often encountered Japanese tanks by the Allies during the entire conflict. It was largely deployed in China after the second invasion of 1937, easily outmatching the ill-equipped tank battalions of the National Revolutionary Army of China. Things became serious with the first deployment on the Russian border, during the incidents which led to the large scale battle of Nomonhan plateau, in September 1939. Here, only four Type 97s were incorporated into the 3rd Tank Regiment of the 1st Tank Corp under Lt. General Yasuoka Masaomi’s command. One of these, serving as the command tank, was stuck in a tank trap and burst into flames after being shot by several BT-5s, BT-7s, and AT guns. Others were disabled, proving their main gun was no match for the Russian long range, high muzzle velocity weapons. Manchurian Type 97s that remained, once again fought against Soviet forces in August 1945. By then, most Russian tanks were one generation ahead. During the battle of Malaya and of Singapore, Yamashita’s 3rd Tank Group comprised dozens of Type 97s. The 3rd Tank Company under First Lieutenant Yamane (Saeki Detachment) distinguished itself, spearheading the attack on the British defenses. The Chi-Ha proved capable of fending off thick jungle and seemingly impassable terrain and were key to Yamashita’s victory. The 2nd and 14th Tank Regiments, also largely composed of Chi-Has, participated in the Burma campaign. In the Philippines, in May 1942, the first Shinhoto Chi-Ha entered in action against Wainwright’s armored forces, comprising mainly light M3 tanks. Their improved gun proved lethal, enabling the engaged Japanese units to conclude the battle of Corregidor with a crushing victory. The next step was in the Eastern Indies (Indonesia), against the combined ABDA ground forces. Despite the muddy, hilly terrain, thick, soaked jungle, and scorching heath, some Type 97s participated in the operations, although in limited numbers. They were to be used in Papua/New Guinea, and some fought at Guadalcanal during the offensive of the Solomon islands. Later, during the Pacific campaign, many Type 97s of the IJ Marines were posted on strategic islands, and found themselves engaged in desperate defensive actions. Their most notable intervention occurred during the combined offensive of Colonel Takashi Goto’s 9th Tank Regiment and Colonel Yukimatsu Ogawa’s 136rd Infantry Regiment, combining nearly sixty Chi-Ha and Ha-Go tanks, along with many tankettes, at Saipan, against the US 6th Marine Regiment. 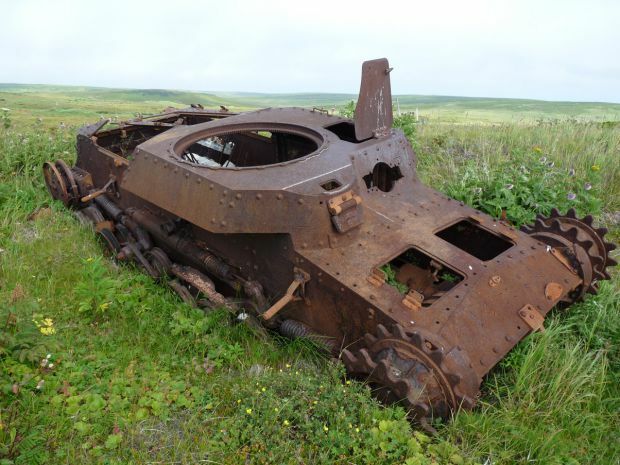 They were broken by a hellish fire from land (tanks and field artillery), sea (naval guns), and air. This was the last and largest Japanese offensive involving such armor during the conflict. 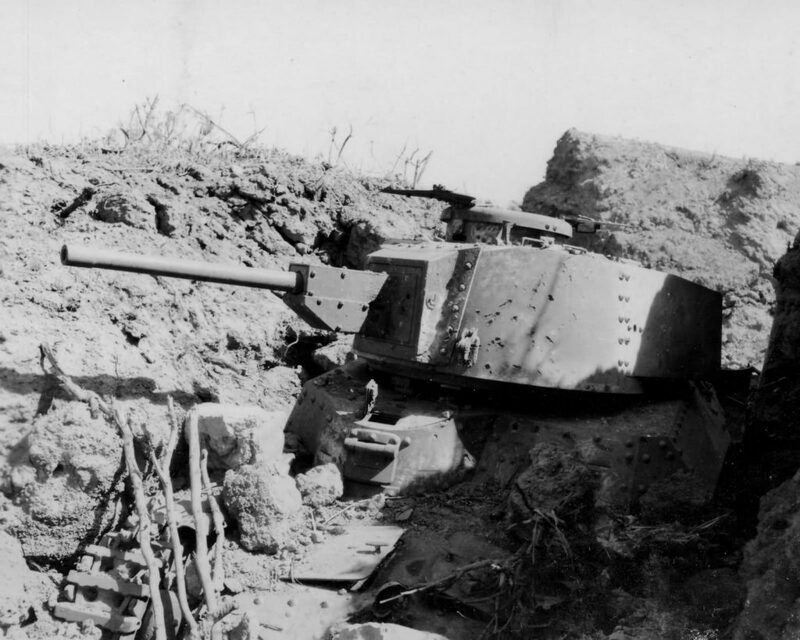 On many other islands, Chi-Ha tanks were simply half buried in the ground, as defensive positions, since their armor proved largely inferior to the M4 Sherman and most Allied tanks sent in this sector. Numerical inferiority proved to be an issue too often. At Peleliu, Iwo Jima, and Okinawa, the few Type 97s left were outnumbered up to ten to one, and a single infantry battalion counted several bazooka operators, all deadly against the Chi-Ha. The last production batches of the Chi-Ha Kai, in 1943, were kept inside mainland Japan, provisioned for the future expected invasion. Other served as testbeds for many new vehicles, or converted for other purposes. Few have survived to this day. A sizable force of captured Chi-Has had been used against the communists, after the war in China by Nationalist forces, and many had been captured during the war. Surviving examples today can be seen in the Japan Yushukan Museum (Tokyo) and Wakajishi Shrine (Fujinomiya, Shizuoka), Brawijaya Museum at Malang (Indonesia), at the People’s Liberation Museum, Beijing, China, and one was at the Aberdeen Proving Grounds in the United States. Countless rusty wrecks still haunt many Pacific islands today. Type 97 Chi-Ha early, unknown unit, Manchuria, 1940. Type 97 Chi-Ha early, unknown unit, Southern China, 1941. Type 97 Chi-Ha, 1st Sensha Rentai, 25th Imperial Japanese Army, Malaya, Jitra sector, December 1941. Chi-Ha of an unknown unit, Burma, December 1941. Type 97 Chi-Ha, unknown unit of the Imperial Japanese Navy, 1942. Type 97 Chi-Ha of an unknown Imperial Japanese Navy unit, Burma, 1942. Type 97 Chi-Ha late, 5th Company, 17th Tank Regiment, New Guinea, 1943. Late production Chi-Ha, 14th Independent Company Jeju-do, Japan, summer 1945. Type 97 Chi-Ha Kai, unknown unit of the Imperial Japanese Navy, 1943. Type 97 Chi-Ha Kai, 11th Sensha Rentai (Armored regiment), 2nd Sensha Shidan (IJA Armored division), based in the Philippines in early 1944. This unit was redeployed, in January 1944, from Manchuria. Later, in early 1945, it was moved to Okinawa with a complement of brand new Type 97 Chi-Ha Kais, renamed 27th Sensha Rentai. The character “shi” before the identification number means “warrior”. Type 97 Chi-Ha Kai, 11th Tank Regiment, Kuril Islands, early 1945. Type 97 Chi-Ha Kai, 7th Regiment, 2nd IJA Armored Division, Luzon, Philippines. Type 97 Chi-Ha Kai, 5th Tank Regiment, 1st Armored Division, Kyushu, Japan, summer 1945. The blue and white rectangle is a tactical reconnaissance symbol. Modified Naval variant of the Chi-Ha Kai with a 120mm Short-Barreled howitzer. Assigned to the Special Naval Landing Forces (SNLF). Full article on this variant can be found HERE. A Shi-Ki command tank, a wartime variant using the Type 97 chassis. Changes include a new long range horseshoe radio antenna, modified commander cupola, shortened turret, sometimes fitted with a dummy gun, and a 37 mm (1.46 in) antitank gun replacing the frontal machine-gun in a new redesigned casemate. Total production of this variant is unknown. Here is a commander vehicle from an Imperial Navy tank regiment. I am a board game designer and I wonder if you would like to make an arrangement to have your beautiful Japanese Tank Art in the game. Sorry to sound like a pedant but I’ve never read any sources that state there were any M2A1 light tanks in the Philippines. Also there were no operational American tanks left by May 1942 (most of the important tank battles having taken place in December and January) unless you want to count Japanese captured M3 Stuarts. Indeed, you are correct! The reference to the M2A1 was removed. Thank you, and please check your email. In the book “How America Saved the World by Eric Hammel” page 195, there is a passing mention of M2A1s being deployed in the Philippines. And also the annotated Morton account noted friendly losses in the Battle of Baliuag consisted of one M3 and four M2 tanks. Is it true that there were M2 light tanks deployed in the Philippines? They were indeed. They were used up to about 1943, notably serving on Guadalcanal. 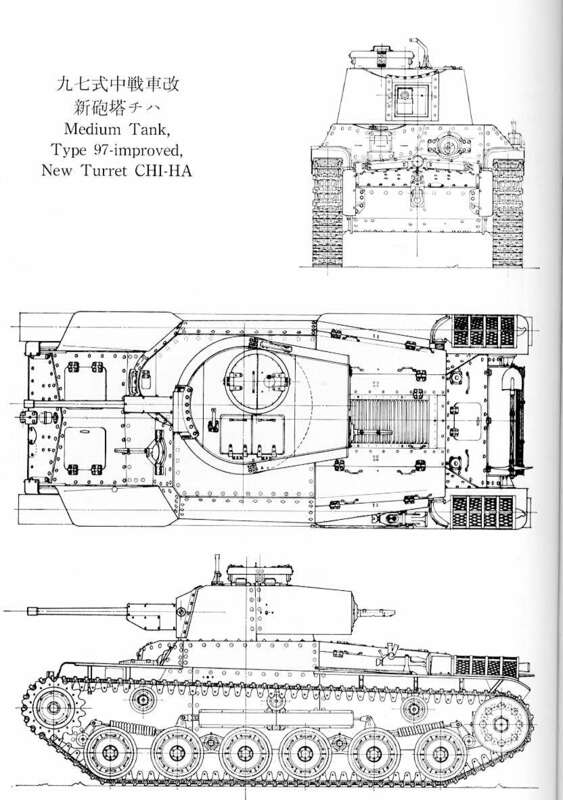 Since the original chi ha couldn’t penetrate very much armor, would it have been possible to place the Ha-Go type 95 cannon in the turret of it? They look to have the same size mount, plus the 37mm is lighter, and penetrates a little more. I can fully understand if it is unknown. It’s a little less than a year later, but the Tank Encyclopedia now has a official Discord channel. It’s linked on the main page of the encyclopedia.